A short walk from the apartment takes you to the superb and varied beaches from busy and sandy to small pebble coves, many of which are blue flag. There is a pleasant and scenic walk along the coast to Playa Flamenca, La Zenia for water sports, Cabo Roig and Punta Prima. The popular Flamenca Beach commercial centre is only a short stroll from the apartment, where you will find many bars, restaurants, shops and banks. Also nearby is a Go Kart track. There is an Aqua park just outside Torrevieja which also boasts a marina and long promenade. The fantastic Terra Mitica theme park, Terra Natura zoo park and Aqua Natura water park are about 90 mins away by car near Benidorm. Please note there is no smoking inside the apartment and no pets. Hi, we are a family of 4 from the North West of England. We bought our apartment in 2006 so that we could enjoy family holidays in the Spanish sun. We chose the apartment for the afternoon and evening sunshine as it is west facing and on the quieter side of the complex. It also boasts a view over one of the swimming pools, allowing us to keep an eye on the children enjoying themselves in the pool and garden, while we relax on the balcony with a good book and glass of the excellent local vino. The complex is secure and safe, the surrounding area is lively without being rowdy. The apartment itself is very quiet in the evenings. Everything you could possibly want on holiday is in walking distance. Or if you prefer the road network is excellent and there are plenty things to do and see if you hire a car, from superb golf courses, scuba diving, aqua parks, horse riding to name but a few. Both bathrooms are en-suite with WC and wash basin. Main has bath, bidet and shower. Second has shower. Both have underfloor heating. 2 twin sofas, dining table and 4 chairs. coffee tables, satellite TV with UK channels and sports channel showing premier league matches, DVD player. Fold up bed suitable for children/teenagers. Cooker, hob, fridge/freezer, kettle, toaster, microwave. 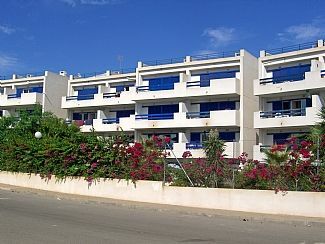 There are 3 golf courses, VillaMartin, Las Ramblas, and Campomar within 5-10 minutes drive. The championship golf courses at Le Manga Club resort only 40 minutes to South. Notes on accommodation: Children can be supervised in the pool from the balcony. There is heating in the living room for early and late seasons. Outside: 4 shared pools. (3 kidney shaped pools with children's paddling pool, 1 large feature pool in the centre of the complex). Large gardens with decked sun bathing areas. Utility Room: Washing machine. Cleaning / Towels / Linen / Maid service: Linen and towels provided can be changed on request, usually weekly. There is a separate local charge for cleaning/linen change 70 euros. Please bring your own beach towels. Other: Large balcony off lounge and main bedroom with table, 5 chairs and parasol. 4 sun loungers, 2 beach chairs, 1 beach parasol. Disappointing will not be booking again. Apartment was shabby in comparison to others I've stayed in. The beds were metal uncomfortable and very noisy, bedding was sparse one very flat pillow each.Shower curtain was disgusting very disappointing as the owner was quite helpful when booking. Thanks for the comments which I've taken on board and hopefully resolved. I have spoken to my agent and this should not have happened in the first place and will not happen again. Bedding, towels and shower curtains were all replaced on receipt of the review. I have also replaced all the beds and mattresses; there is now a brand new double bed in the master bedroom and 2 new single beds in the second room. Please note my agent lives on site, is easily contactable and will address any issues or problems as soon as possible. There are several beaches all within walking distance, the closest beach is a 10 mins walk. There are promenades linking formal walkways to 6 beaches to the south. Alicante 45 mins. Murcia 20 mins. Airport pickups can be arranged. Murcia 35€ each way (if 2 cars requires 30€ per car). Alicante 45€ each way (if 2 cars required 40€ per car). Beaches, restaurants and entertainment are all within walking distance.